Jul 05, 2012 - Reading time: 3 minutes. 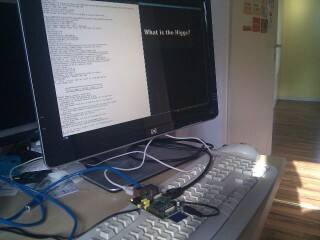 Today my Raspberry Pi arrived and I quickly got it up and running. Now that you've seen one in action, here is some info how I successfully setup the Raspberry Pi. A USB keyboard (and mouse). Got that. A LAN cable, I have several. Next I needed an image to boot. I use the archlinux image. Get it from the download section. Putting the SD Card in the slot, adding the cables and it booted up! Yey! I even got video output, atleast on my TV. Not so on the other display. It always switched to standby without any chance to get an output. # Use "safe mode" settings to try to boot with maximum hdmi compatibility. Ok, so it boots up again, now with video output on the display here. To bad there's no LAN port in my room. 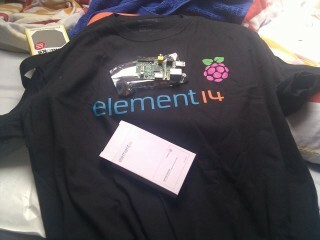 This has nothing to do with the Raspberry Pi itself but with simple network forwarding. I connected the Pi via LAN to my laptop which got it's internet connection via WLAN. Now it works like a charm (I added this config to rc.conf so it works after boot). Then added snd-bcm2835 to the MODULES section in rc.conf so it gets loaded after boot. I won't show my basic i3 and i3status configuration here. Feel free to ask if you've got any questions. Ok, what's left? A browser. That's it for now. The basic setup of my Pi is done. I want xbmc to run on my Raspberry Pi, because that's what I bought it for: it should become my media computer in the living room.